Our wooden packing cases and crates have been exported all over the world to places including Asia, North America, Russia, and Australia. These custom wooden packing cases have helped transport and protect a wide range of items such as specialised building products, machinery and other such valuable items. 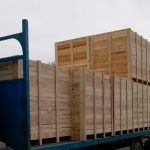 All our wooden packing cases use timber from sustainable, responsibly managed forests and can be treated to ISPM 15 regulations should you require it. These Wooden Packing Cases are fully boarded and solid on all sides and have a built in wooden pallet for ease of transportation. 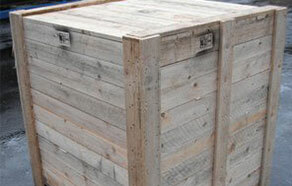 They are designed to enclose the cargo within timber cladding and are fully secure. Wooden Packing Crates are slightly different. They have partially open slatted sides and tops but a solid wooden pallet style base. This means that the contents are fully visible, which can simplify the process of passing through customs inspections and reduce the need to repack the goods after a thorough investigation. These are still a secure solution, but offer that versatility at a more affordable price. All our wooden packing cases are bespoke and produced to the individual requirements of each of our customers. We have made cases as small as 8 inches square and some as long as 5 metres. They can be supplied to you flat pack or fully erected with one side tacked for ease of packing. All our cases can now be supplied Heat Treated in our very own Heat Treatment Kiln to meet ISPM15 regulations. Please feel free to contact us with your requirements, if you have any questions about our wooden packing cases, wooden packing crates or the goods you are looking to transport.